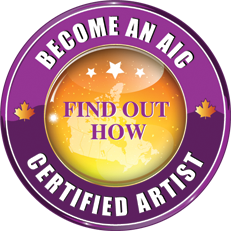 “I’m a self-taught artist originally from a small town called Warren Ontario. I married in 1978 and became a hairstylist. We now have 3 wonderful sons who have always been supportive and never complained when I would paint for long hours at a time. We now live in Airdrie Alberta, the change has been wonderful, and I always wanted to be near the mountains. Mountain paintings and wildlife that we see in the mountains are some of my favorite subjects. I started taking interest in painting in 1990 and bought books on how to paint and learned different techniques. With practice, perseverance and determination I got better as time went by. I started to teach decorative painting for 4 years in Ontario, after that I would practice painting sceneries and wildlife on my own. Through trial and error I continued painting every day trying out new techniques and learning more about animals. I’ve tried different mediums but my favorite is acrylic. Now, being semi-retired and the boy’s all grown up and on their own, I can dedicate more of my time towards my passion “PAINTING”. 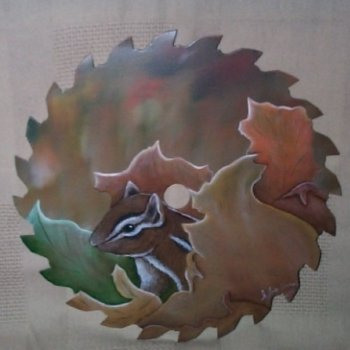 I also do custom work on saws, canvas and wood.